Tom is a grad of Michigan State University and has worked throughout the automotive electronics supply chain, including at Ford Electronics, Lear, TRW and a large automotive chip manufacturer. Prior to the work, he helped design the boards that detected the Top Quark at Fermi Lab. Attached are some photos of a couple of the “D0” (D-zero) equipment cards that I designed back in the late 1980’s for the Fermilab particle accelerator in Neperville, IL. These were part of the experiment that confirmed the “top quark” and are closing in on the potential of the Higgs boson. The Fermilab Tevatron and collider was shut down just last September, but there’s so much data that the physicists can continue to crunch, that they keep finding stuff. 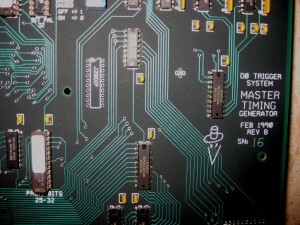 The “master timing generator” (MTG) was loaded with a whole slew of bipolar PAL’s to generate the weird trigger/transfer control signals required in the rest of the system. 6 layers, mixed TTL and ECL. 54 MHz accelerator ring resonance frequency, but skew was super critical so hence the ECL signal path and bipolar pals. The Calorimeter Trigger Backplane was my PCB layout masterpiece – those interconnect signals aren’t simply bussed – there’s a very complicated interconnect scheme between them to reflect the physical layout of the calorimeter detectors. PCB is 16 layers, 4 plane layers, the remaining 12 are signal layers with the differential ECL traces between, with all attempts made to control the impedance of the interconnect (ECL likes 100 ohm Z0). Blind and buried vias were used as well. I recall the day we sent out the magnetic tape reel (!) 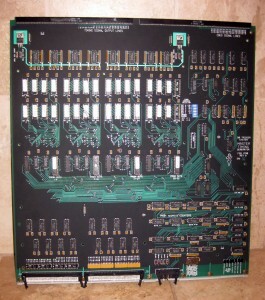 with the gerber data to the only company that returned a bid on the job – we commented that we could either order two of these backplanes, or go and buy a new Chevy Corvette – each PCB was about $11K in 1988 dollars, IIRC. These were designed on an Intergraph CAD workstation, based upon a VAX 11/750 minicomputer, dual 20-something-inch monitors, 2-foot x 4 foot electromagnetic mouse+digitizer, etc. Pretty heavy duty stuff for a dumbass college student to be using! I became a complete CAD snob after that experience. In recent news, Cray (the supercomputing company) was bought by Intel. 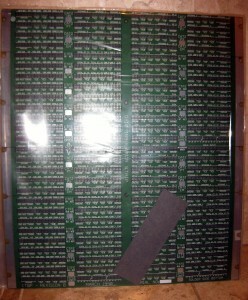 Tom got his start in RF working on the Super Regenerative circuit. He sent us a great scan of a 1922 article from Armstrong about the Super Regen Circuit. Armstrong also invented the Super Heterodyne circuit. For those interested in automotive testing, Tom sent us a link to a paper Ford published about their EMC testing requirements. We also talked about the automotive supply chain and how the chip vendors are required to do stringent temperature testing and guarantee parts for 10 years. Cars primarily use the CAN bus to communicate these days, though they also use the lower cost LIN bus in more places where it’s less critical. Dave was thinking about the previously discussed news about BugLabs pairing with Ford on opening up their infotainment system. We announced the Lemnos Labs hardware incubator program, which is closing its applications in 2 weeks. While we don’t know a lot about the program, people encouraging hardware sound good to us! Thanks again to Tom for being a guest on our show. It was great getting his insight into the world of automotive electronics. If you have any questions for him, please leave them in the comments! Update: Tom has capitulated and joined Twitter since we recorded the show. Hooray! Find him on there as @TomLeMense! I’m actually going to hack my car’s ‘convenience’ CAN bus shortly so I can control the windows and doorlocks via cellphone connection. It would have cost them a bit more than what they paid for the interconnect technology to get the entire company. They paid 140 million for the technology. Cray’s market cap at the time the deal was announced was about twice that. It is now about 400 million thanks to their stock jumping from $7 to $11 after the deal was announced. Too right you are TerminalJack. Sorry about that, I need to read my articles better. Have had car parts stolen that way. Toyota Venture had distributor stolen whilst parked outside for 20 minutes……. Took me 4 hours going through scrapyards by phone to find one, as agents no stock, and wounded buffalo price. Was at last number before i found one, and paid the price without a murmer……… Flew out to it and took everything vaguely attached to it as well for good measure. Needed it as well. Awesome show guys, very enjoyable. According to the NYPD, greater than 60% of vehicles are stolen for parts only. “Chop shops”, as they are colloquially called, are a thriving business and EXTREMELY profitable. That is why a ton of parts have the vehicles VIN number stamped on them. Any fans of Cromemco out there? A minicomputer built into an office desk. The guts were mounted where the drawers would be, and you had your choice of wood (maple or cherry). Oh, bring back the days of 8″ floppies! Just kidding thank you very much! I have excellent results with Seagate external drives. I have had several and have been upgrading because of space, the originals are still being used as ‘hand me downs’. We used to use the 10116 ECL Line Receivers as low-level post-amplifiers for fiber optic receivers – since they were nice emitter coupled diff-pairs with e-follower outputs. ECL was the “Bugatti” of digital families back in the day. A google search will turn up a few instances of the _MECL System Design Handbook_, which is the ECL Bible in terms of using these parts. More importantly, it contains a ton of good information about high speed design and high frequency design in general – things that never really go out of style: PCB design guidlines, thermal considerations, power supply distribution, etc. I highly recommend seeking out a soft copy and giving it a read if you’re concerned about high-speed or low-skew. Loved the show; the interaction between the hosts and the guest is really nice! Unfortunately stealing cars for parts is a very common business back in my home country; the older the better. I recall my dad and I making ignition anti-theft systems with hidden switches and installing them in our cars and in some close family ones. I worked for a short time at TRW in the uk at their Airbag/ seatbelt manufacturing facility. The electronic section was a static safe production environment with reflow and pick and place machines, routers and ovens chillers for QA etc nothing really special….until you went outside and saw the massive (over 10 feet high) grassed blast walls incase of an accident in the explosives dept. A little unnerving at first Lol. One of main arguments for introducing CAN was the “Make It Cheaper” force. Two-wire bus instead many-to-1 that is tens km / kg of cooper less. Not only for a regular car but imagine an articulated bus. But the CAN itself is quite neat in terms of robustness. There are estimations of 1 undetected error every 1000 (10^3) years. That was the initial pitch of the automotive multiplex bus – “think of the savings in copper”. Of course, all that copper gets replaced by silicon…so not cheaper at all. One thing that CAN (and MOST, and maybe FlexRay – if it lives) bring to the party is interaction between subsystems. For example, when you use YOUR RF keyfob to unlock the car, the entry system can tell the rest of the vehicle “here comes user #1” and the seat position, radio presets, etc. can all be set accordingly. In the pre-bus days, discrete wires had to be run between these modules – so it actually cost money to do these “personality features” – now, it costs no additional hardware to implement. Can bus is very popular in industry too, connecting together plc’s , motor controllers, sensors etc even machine to machine controlling whole processes. A really great show with a great guest. It’s always interesting to hear from an insider about the challenges of design when they are placed in the real world. More shows like this would be fantastic, how about someone from the aerospace industry. It would be so cool to hear about the design aspects of electronics sent into space. Go Amp-Hour! This is the kind of “context” I like, more of the electronic product lifecycle details from industry. … I forgot to Thank Tom for his appearance on the show. Very informative Tom, I appreciate it.